Is the Quant Investing stock screener the best choice for you? 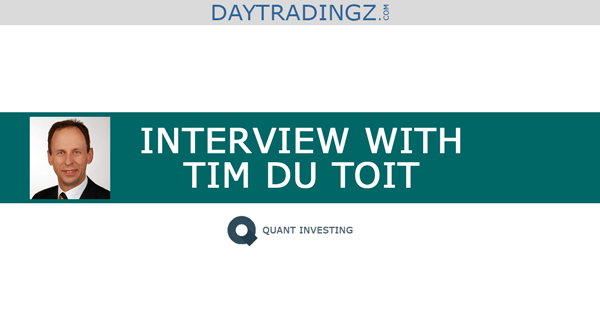 After reading this interview with Tim du Toit, Head Analyst and founder of Quant Investing you‘ll know for sure! ​​In this interview, Tim will tell us something about the philosophy of Quant-Investing.com and he will also reveal some details about his personal way of dealing with the financial markets. First of all, thanks a lot for taking the time for this interview! In the beginning, please, tell us a little bit more about yourself. As I could not find a screener that met all our needs a friend and I decided to build a screener to invest our own money and the Quant Investing screener was born. We launched the screener in September 2014 and have improved on it all the time based on our own research and the back test research we do all the time. Which products and services does Quant Investing offer for private customers? Our most popular product is the screener​. At the moment the screener database has over 22,000 companies in 36 countries (all developed markets world-wide) and more than 96 ratios and indicators you can use to find investment ideas. We also offer a newsletter ​which follows a strict quantitative value investment approach and has strong systems in place to limit losses – especially when markets start falling. You can read more about the newsletter here: www.quant-investing.com/newsletter-about and here: This is how we select ideas for the Quant Value newsletter​ And you can sign up here: Join today​. What are the costs for customers using your products and services? Our cost structure is really simple and we do our best to keep prices low to make it is a good investment even if your portfolio is small. We also have a very generous refund policy. You can use any of our products for up to 14 days and get a FULL refund. Even after that you can always get the unused part of your subscription back. No questions asked. This is simply how we would like to be treated if we were a customer. Which unique selling points distinguish Quant Investing from other providers in the market? Because of this we test and write about new strategies and ideas we find all the time. You can read about everything on our blog which is free. You can find the blog here: Quant Investing Blog​. If we find an idea or investment strategy that works we immediately include all the ratios and indicators you need to implement it in the screener. That is the reason why the screener already has 96 ratios and indicators you can use to find investment ideas. Because we invest our own money using the screener we make VERY sure that it is always up to date with high quality data. We cannot name our data supplier, because of contractual reasons, but what we can say is it’s one of the big data suppliers that large fund managers also use. It is so expensive that very few individual investors can afford it. This is also the reason why we have made the screener available to other investors, because only together we can afford such a high quality data source. What do your customers value most about Quant Investing? 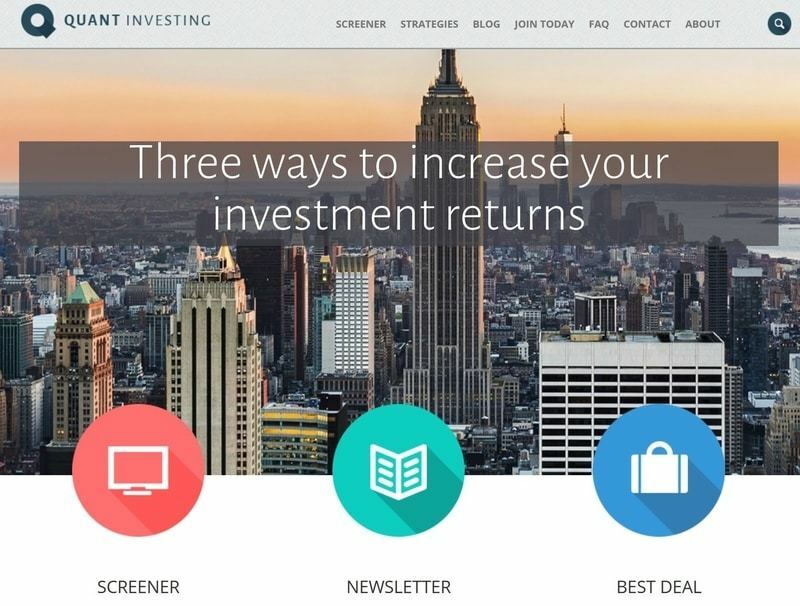 It is mainly the great returns they have made using the screener and the newsletter. "Tim I want to which you a happy new year and thank you for your work on your screener. Last year (2016) I had a 21% profit, and I could not have done it without your software." "The Quant Investing screener is, in my opinion, the best equity screener available to the retail investor like myself. What are the reasons to become a Quant Investing customer today? As I mentioned we offer two products by investors for investors. If you want to look for your own investment ideas (irrespective of what your investment strategy is) the screener is the right product for you. You can use it to screen over 22,000 companies worldwide using over 96 ratios and indicators. If you do not want to spend a lot of time on your investments but want an understandable really good time tested investment strategy the newsletter would be the products for you. We get these ideas from the best investment strategies we have developed, and back tests we do on a continuous basis. Who is able to become your customer? We do not have any subscription requirements or minimum subscription periods. You can sign up for only 1 month if you want to and, if within 14 days you see it is not the right product for you, just send us a quick mail (no reason necessary) and we will give you a full refund. Do you have a special offer for my readers? We have put together a series of short presentations of you best ideas here​. Tim anything you’d like to say in closing? Each investor has his or her own unique approach to investing and that is a good thing else we will all be buying the exact same companies. Also investing is not a difficult skill to master but it is more difficult than it looks. If you are interested in investing your own money my best advice is to ignore the popular media completely - read books and research studies by other investors that have been successful over long periods of time in up and down markets. Learn from each of them but build your own investment strategy by taking the best from what you've learned that makes sense to you. Each person has a different temperament and invests in a different way. But if you follow time-tested investment strategies and build your investment strategy on what has worked you cannot do anything else but have outstanding returns over long periods of time. Tim, thanks a lot for taking the time to answer our questions. All my very best wishes for your business and for your personal life!